It getting close that time of year when the Doppelbocks will be flooding the shelves of our local liquor stores just in time for Lent. Traditionally Doppelbocks are strong German lagers, also commonly know as liquid bread. German monks would brew this beer to sustain them through the fast of Lent. 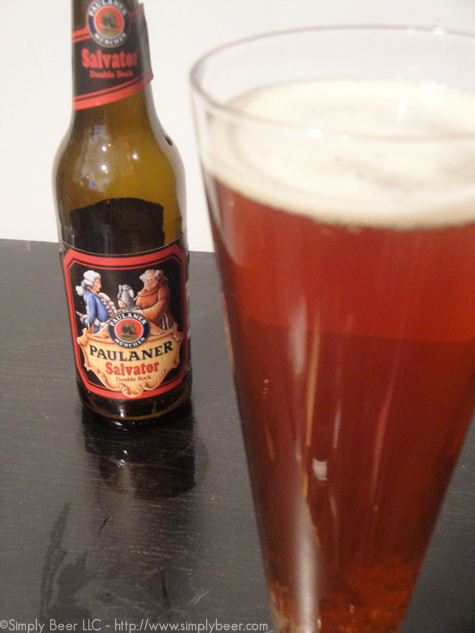 The Paulaner Salvator is one of the oldest German Doppelbock, the monks first started brewing this beer over 360 years ago. This beer is a dark amber color, fairly clear with hings of brilliant orange when held to the light. Even though the head collapsed pretty quickly on this beer it did have a bit of carbonation to it with co2 bubbles continued to trickle to the top. A very malty aroma awaits you with this beer. Hints of caramel, alcohol and plum accompany the sweet maltiness. A bit thin for a Doppelbock, but still had a decent mouthfeel. The overwhelming flavor was malt caramel sweetness. As with almost all beers, once you get past the initial flavor(s) and start looking deep into the beer other characteristics will emerge. With the Salvator, there was a pretty significant alcohol presence along with figs & cherries. This is one of the oldest commercial Doppelbocks we get in the US, so I would consider it the style. As with most styles, they can range in colors, flavors, and aromas. This was an easy drinking Doppelbock, not as heavy as some or what this beer used to be. Also a good winter warmer type beer. If you like this beer I would suggest trying some other Doppelbocks. I love the history behind brews, and the doppelbock is no different. I think Salvator’s version is delicious. It’s been a while, but I distinctly recall cherries as well. Nice pics. You must have a good camera. it’s a point and shoot, $200 camera. Seems to work pretty well once I figured out how to manipulate it into submission. I look forward to Doppelbock season. Love the big malty lagers. Peter: First off , Nice review. I didn’t know the history behind this style of beer and now I do. I always appreciate that. You mentioned that this beer used to be heavier. Do you think that is just the variation that happens from year to year, or do you think they have manipulated it to better fit with today’s marketplace? Don, thanks. Hard to say, I just remember this beer being darker many years ago. Not sure if the flavor has changed much, but it could just be a difference in grain availablity or change in brewers or marketing. Who knows, but if someone does I would love to know. Just did my weekly beer and cheese pairing. I chose Robusto (7 month Gouda) with Ayinger’s Celebrator. Celebrator has to be one of the best ones I’ve had. I like this one, too. But I made a pretty authentic one last year and plan on making one this year. Point and shoot? I’m surprised. I am camera-less right now. I’m with you guys on the celebrator. Gold standard is a good way of putting it. My kids always try to talk me into buying it at the store for the goat necklace. I’m sticking with Doppelbocks… I had a Triple Bock last night that I couldn’t pour down the drain quickly enough!!! Kevin, I have a 6er of the Victory, of which I’ve had one, but I was a bit disappointing for a victory beer. Going to have another to make sure. OMG! 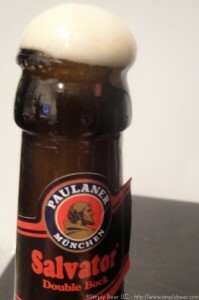 I LOVE Paulaner Salvator Double Bock!!!! Have only had it once in North Carolina or Florida…can’t remember…anyway, I live in Illinois and can’t find that beer anywhere! I would love to know where in Illinois, North Carolina or possibly Florida I can find it…YUM! Sorry guys, I am not a beer expert here LOL, just like dark beer better than any other kind…thanks for any info.